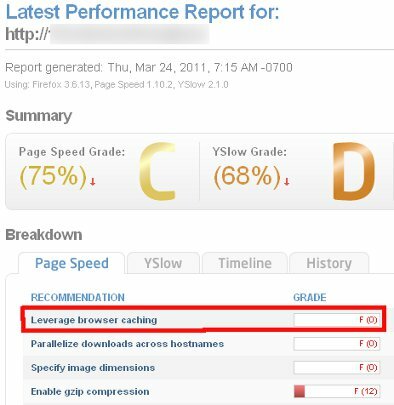 You’ve got a lotus Domino web server, and you have been told that “leverage browser caching” is a must do. This means that we have to tell the browser everywhere in the web to use cache. In other words, we set (and send) an expiration date in the HTTP headers to instruct the browser to use his cache for further visit. It takes 5 to 10 minutes. In you Administrator client, in the Configuration tab, expand the Web section and click Internet Sites. Open you server(s) document in the view and create rule. n.b. For more information on how to create rule look at: http://publib.boulder.ibm.com/infocenter/domhelp/v8r0/index.jsp?topic=/com.ibm.help.domino.admin.doc/DOC/H_WEB_SITE_RULES.html, in short you open the document of the server and click on “Web Site…/Create Rule” button. In the Basic Tab: first choose Type of rule: HTTP response headers. In the Incoming URL pattern: enter a pattern that will be like “*.css*”. The important part: You have to check Expires header: Always add header (override application's header). Specify a number of days. According to my 5 cents opinion, week or even month is OK for images or flash (*.swf). Well, nothing is definitive and if you really want to change the code you still can change the name of the library, which will force of course a refresh of the browser cache. You already guessed that you need to create a second document precising “*.jpg*” a third …. and so on. Now a very good tip, we of course want to copy past this IS possible but be careful this document is a response document. 1 - copy the document with the rule, 2- GO TO THE LINE OF THE SERVER without opening it, 3- on this line, past.You just have to change the newly pasted document.